Hello friends, Today I will tell you What is Android Pay and how to Use Android Pay. You can use Android Pay on all Android Phone. I have shared a complete guide how Android Pay works. Users can quickly make payments using Android pay using the methods listed in this article. I have shared all the steps to use Android pay on a retailer store or ATM. Android Pay (now renamed as Google Pay) is a type of digital wallet which can be used to send or receive money. It was developed by Google Inc in 2015. It was announced at the Google I/O event at the year 2015. On 11 September 2015, it was introduced at Android Pay. Later on 23 October 2017 its renamed from Android to Google Pay. Basically, it is designed for the people to purchase items or service both completely online in the real world. Android Pay can be used in Android smartphones and smartwatches both the devices. It is available in the banks and other financial institutes in which the country names are UK, Canada, Ireland, Poland, Singapore, Australia, Hong Kong, Taiwan, Belgium, Japan, Russia, New Zealand, South Korea and Brazil. The big difference between Android Pay, Samsung Pay, and Apple Pay is that you can not use Apple Pay on Android devices and vice versa. Similarly, you can not use Samsung Pay on Android devices and vice versa. However, the working of all three payment services is similar. All these services use NFC hardware to pay for items at POS terminals. Samsung Pay also uses NFC along with the MST technology (Magnetic Secure Transmission) where Android Pay did not use it. Samsung Pay is mostly used in Galaxy phones. Where Apple Pay is used in iOS devices. Hence, Android Pay is used on all Android devices such as smartphone and smartwatch. The fact is that majority of the people uses Android devices and though Android Pay is more popular than others. First of all, users are required to add their card detail in Android Pay app. Now, when a person needs to pay the amount using Android Pay, then the person will take the phone and place it near the retailer’s POS terminal. A signal is sent from phone to POS terminal using NFC. However, Android Pay can also be used in the ATMs where NFC is supported. Thus, in this way the Android Pay system works. I think now you have got an idea that what is the working of Android pay app and its services. After reading the working of Android pay, you have got an idea that how much simple is to use Android pay. So, do you want to know that how to use android pay? If you are saying yes then this section of the article is for you. Before using the Android pay app on your smartphone, you need only one thing that is a good internet connection. And the most common thing which you need is an Android smartphone having Android version 5.0 (Marshmallow)or higher. If you are having all these stuff, then you can learn how to use android pay using this guide. Get the Android Pay app from Google Play Store. Now, open the app and add money to it using DC/CC cards. Then, you will have some money on your Android pay wallet. Now, go to the shop where Android Pay is available. To pay an amount at the shop directly open the app and take it to the POS terminal. That’s it. Now, the app will deduct the amount automatically from your Android pay wallet. We have seen every essential information regarding Android Pay and learned that how to use android pay. To get to know that how to use android pay easily you must check that section very carefully. 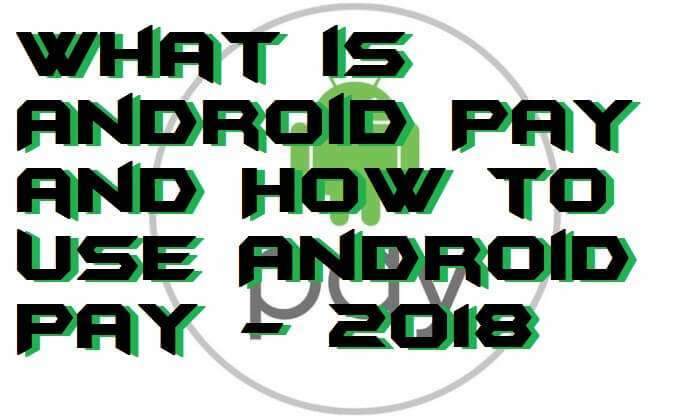 Because when you will get to know that how does Android Pay works then it will be easy for you to learn how to use android pay. I hope using this article you have got all information related to Android Pay. You can share this article with your colleagues also. Though, they can also get all the information regarding Android Pay.